Working with Daly as our planner for our wedding at Saltwater Farm Vineyard made the entire wedding planning process enjoyable when it could sometimes become stressful. Daly offered her professional opinions when we needed them and helped make our dream wedding a reality. From start to finish, she took care of not only what went on behind the scenes but she made sure that we were as comfortable and happy as possible. Through our frequent visits to her and to Saltwater Farm Vineyard, we became close with Daly and grew a relationship with her. From day one she showed compassion for her work and it was evident she would move mountains if it meant giving us the wedding we always wanted. Daly was amazing from start to finish, and without her, we wouldn’t have had the most perfect wedding day that we did. The owners of Saltwater Farm Vineyard recommended Daly to assist with our planning & day-of festivities. Daly truly knows the venue like the back of her hand, and has tremendous experience. From the moment we chatted on the phone, I knew working with her was going to be a breeze. We decided the best package for us would be the “Day Of”, however she provided so much more. Daly was always available via email or text, and patiently handled all of our questions. She provided knowledgeable insight and advice for all the moving parts a wedding includes. In addition to setting up the ceremony, transportation, day-of logistics and more - Daly handed all of the decorating of the vineyard while we were at the church. When I entered Saltwater for the reception, I was blown away. She took care of every single detail – everything was set up so much better than I had ever anticipated. Daly is a patient perfectionist, and truly talented! When Daly came to visit the morning of my wedding, it felt like one of my best friends walked through the door. If I could have thrown a bridesmaid dress on Daly, I absolutely would have! The best part was how impressed my parents, in-laws, and guests were. She is a true professional that cares about your special day. She is non-invasive, patient, and so kind. She knows how special a wedding is, and wants nothing more than the pair she is working with to have the best day of their lives. Daly is a blessing and she is highly recommended! My husband and I had the pleasure of working with Daly in September 2016. She came highly recommended from the owners of our wedding venue, Saltwater Farm Vineyard. Daly is well spoken, organized, vivacious and experienced. I think the most important quality for a wedding planner is being responsive and Daly went above and beyond to make sure every question I had was answered the same day if not within the same hour! The week of our wedding, I was refreshing the weather app hoping the rain predicted for our day would vanish. Daly checked on me daily (no pun intended) to make sure I wasn’t looking at the weather and to reassure me that it’s not going to rain and that our day will be beautiful no matter what. We had checklists for our checklists and backup plans ready to go and I can’t thank her enough for making me feel comfortable and ready for our big day. Sure enough she was right! No rain and we were able to have our ceremony and cocktail hour outside. Daly made sure Chip and I didn’t worry about anything and that the event went smoothly and followed the schedule we drafted. I would recommend Daly in a heartbeat for any event. Thank you for everything Daly! My husband and I were living in Japan during much of the planning phase of our wedding. Despite being on the other side of the world, Daly helped us every step of the way and was always accessible when we needed her. She helped us to lock in our ideal wedding date at Saltwater Farm Vineyard and facilitated communication with local vendors. Daly provided us with excellent vendor recommendations – she gave us a range of choices from florists to photographers, and helped us narrow down the best options for us. Having a great band was really important to us, but we didn’t really know where to start in our entertainment search and being so far away made it difficult. Daly recommended a band that she had heard perform at Saltwater that she felt would meet what we were looking for. We ended up going with her recommendation and they knocked it out of the park – our guests are still talking about the music from our wedding! In the weeks leading up to the wedding, Daly checked in to see if she could assist with any last minute details. She helped coordinate schedules between the reception venue, the photographer, the bus drivers, the florist, the caterer, and the band to make sure everyone was on the same page and the evening would flow smoothly. The night before the wedding, my parents and I got stuck in bumper-to-bumper traffic on the way to the church, making us 40 minutes late to my own rehearsal! Thank goodness for Daly – knowing we had a reservation to make afterwards and several antsy little ones, she kept things flowing and everyone else rehearsed their parts without us. Once my parents and I arrived, we went through everything once more and we were good to go! On the day of the wedding, Daly was at the church making sure everything was in place – from flowers to programs to the train of my dress before I walked down the aisle with my dad. The ceremony went off without a hitch, and the reception was truly seamless. I can honestly say I did not have a single stress or worry on my wedding day. The place cards, table décor, and other small personal touches were set up exactly how we had discussed beforehand. We were fortunate to have a picture perfect September day at Saltwater Farm Vineyard, making for an ideal outdoor cocktail hour. Daly checked in with my dad and they agreed to extend the cocktail hour by a bit. My husband and I didn’t even notice at the time, we were so busy visiting with guests, but were so grateful that she made the choice to extend our time outdoors. As promised, Daly swept us away to the bridal suite at the end of the cocktail hour to ensure we would have a minute to breathe before our first dance. We were greeted with an array of hors d’oeuvres to snack on, which we were extremely appreciative of because we were both too busy chatting to eat much during the cocktail hour! Thanks to Daly’s great communication and coordination, the rest of the night was perfection – from dances to toasts, dinner service to dessert, transportation and all of the other details – everything was perfectly orchestrated and we didn’t have to focus on a thing except enjoying our day! Daly was extremely receptive to our ideas – she heard us when we told her what was important to us, and what was not so important. She took our ideas, our personalities, and our budget into consideration when making recommendations. She was always accessible and she was a great sounding board if you feel like you’re spiraling too far down the Pinterest rabbit hole. I highly recommend Daly’s services to anyone looking for someone who is truly professional, well connected in the area, and is hoping to have a stress-free wedding planning process and wedding day! One of the best decisions we made during the wedding planning process was hiring Daly Sanford. She is reliable, organized, and unflappable. More importantly, her kind demeanor and her sense of humor made her a joy to work with, and a lifelong friend. Though we only hired her for weekend coordination, she helped with everything the led up the wedding and was very generous with her time. From fielding many questions from me in the months leading up to the wedding to participating in meetings and phone calls with my vendors to hosting me for many visits to the venue, Daly always made my vision her number one concern. Though she had many other clients, her level of responsiveness and attention to detail made me feel like I was her only client. Daly is an expert, particularly when it comes to weddings at Saltwater Farm. She has seen more weddings there than any other planners in the area--she knows how to best utilize the space, and provides suggestions and tips that ensure that your wedding will be seamless, your guests will be comfortable, and you and your family will relaxed and free of stress. The weekend of the wedding, Daly exhibited grace under fire and put me and my family at ease, so we could just enjoy the day. Any issues that may have occurred that day were (thankfully) resolved without me knowing they even happened. On the day of the wedding, I did not have to answer any vendor questions, set anything up, or worry about taking presents and decorations home after the reception. I'd be remiss not to mention that I had a very large wedding party--with 8 bridesmaids, 7 groomsmen 3 ushers, and 20 (yes, 20) children. Daly kept all of us on schedule. Out of all the decisions we had to make in the wedding planning process, hiring Daly was the easiest one. Familiar with event planning myself, I knew how important it would be to be able to confide in someone who knew the venue inside and out and had experience planning and running numerous events there. Leading up to the wedding, Daly provided recommendations for everything from color choices, to guest books, linens, transportation, and day of timelines. She answered all of my questions- no matter how silly- in an extremely quick and efficient manner. I only booked the “Day-Of” package, but Daly was always generous with her time and offered to meet or jump on a phone call if I ever needed anything. Even though I was doing a lot of the planning myself, she always checked in with me to make sure I had everything covered. On the day of our wedding, I was confident that Daly would take care of making sure that all of the details would look exactly how I imagined. She made sure that we stuck to our timeline and I received numerous compliments from my guests saying how wonderful Daly was and how smoothly everything ran. It was also such a relief to know that we could enjoy our wedding until the very last minute and Daly would take care of last minute payments and packing everything up. We loved working with Daly and would recommend her again and again. 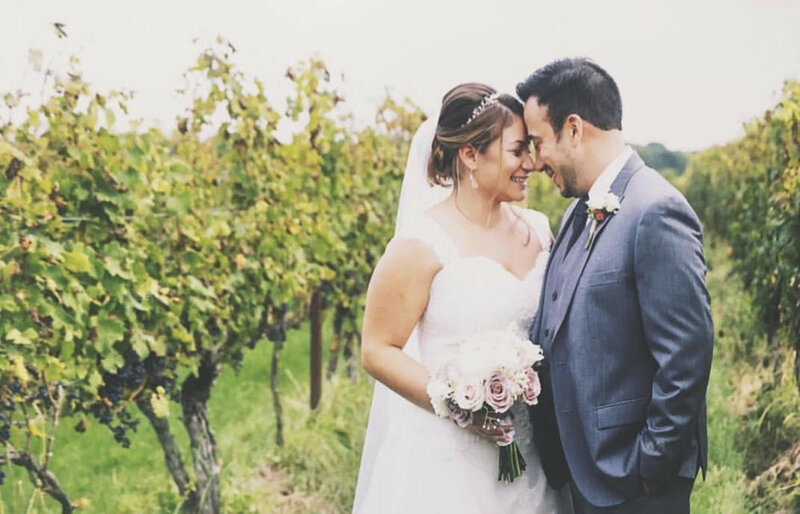 Daly came highly recommended from Merrily Connery, the owner of our wedding venue Saltwater Farm Vineyard. And from the moment Eric and I met Daly, we knew exactly why. She was extremely knowledge, friendly, and energetic. We had our first meeting over a cup of coffee, but I immediately felt as if I was talking to an old friend. We hired Daly, for her day of coordination services, but she consistently went above and beyond to help us through out the entire process. She helped me source and book vendors. She reviewed contracts and joined my phone call catering meetings. She intervened during a linens crisis and made sure I actually had table cloths for the wedding! But most importantly, she made sure Eric and I didn’t have to worry about single thing the day of our event. The whole day went smoothly and I know it’s because of her talent and experience as a coordinator. She styled the venue beautifully and kept everyone on schedule. I feel so lucky to have had Daly with me on the day of the wedding, and would gladly recommend to her any future bride and groom planning a wedding. I can’t thank her enough for helping to make our day so special! We had the pleasure of working with Daly during the summer of 2014 for our daughter’s wedding. Our first impression of Daly was that of confidence! She listened to our wishes for coordinating all the details at the ceremony in the back yard to the reception in the meadow under a tent. She arrived to coordinate the day’s events…being sure all vendors were set up and on time. Daly provided two servers who poured the champagne toast, lit candles, passed appetizers, set out hundreds of cupcakes and kept the wedding reception area tidy. Daly performed flawlessly to coordinate the timeline between the DJ and officiant, the photographer and the processional and the entrance of the bridal party at the reception. It was a great relief to us to have her oversee these details with such grace. Daly would be tops on our list if we were planning another event! We hired Daly to help coordinate our wedding on June 27, 2015 in Watch Hill, Rhode Island and were completely blown away by how everything came together. Daly always had everything in control and there was never a time where we needed to worry about anything. She handled the few last minute hiccups like an absolute pro, which allowed us to spend time with family and friends who had traveled halfway across the country to celebrate our special day with us. Our wedding day was just what we had hoped for and we fielded endless compliments over the overall organization, execution and attention to detail. On behalf of my husband and me, and our families – my parents especially - we’re immensely appreciative of all your efforts. Many thanks for all of your support during the year and for working so hard for us on our special day. Daly is absolutely the BEST!! !…My husband and I were SO happy with Daly’s help and support during, before and after our wedding day. Daly was always super easy to work with, helpful and reliable. She would always send me emails with ideas for the big day, always happy to answer any questions and taking the time to research vendors for us to choose from. At the last minute, my husband and I decided to hire a vendor to do the lighting. Daly not only suggested the best vendors to work with, she was also there during the installation, to ensure everything was installed properly. During our rehearsal, she kept all our family members well organized and informed. She was great communicating with everyone and taking care of everything during the rehearsal. During our wedding, she was on top of everything.I was so happy to have Daly as our wedding planner, she made sure everything was perfect for our wedding day! I was impressed with her organizational skills and her professionalism. All in all, the weekend was incredible and having Daly there allowed us to really enjoy each moment without worrying about anything. world of Pinterest and online research that makes the possibilities more confusing than ever before! On the day of the wedding Daly made sure everything ran on schedule and made sure that Alex and I as well as our guests were having the time of our lives. We had some mishaps with vendor schedules and Daly was instrumental in providing direction and advice on how to handle the issues that arose in a gracious and fair manner. She was a resource not only for everyone on site at the wedding, but also for my bridesmaids who counted on her to help with status updates throughout getting to the ceremony. Both Alex and I, and our entire families were at ease the whole day knowing that Daly was there making sure that we enjoyed every possible second of the best day of our lives. One of the other couples Daly worked with stated that “working with Daly felt like planning our wedding with a friend. She is a true professional and expert who cares about her clients,” – I echo this statement wholeheartedly, we certainly could not have done it without her and would recommend Daly to anyone who is even remotely considering having a wedding planner, one conversation and you’ll be sold! outside for more pictures when the sky looked best. She was also just fun to have around, even joining in the Congo line (we even have that documented in our wedding photos). As a bride, you're pulled in numerous directions all evening, and if you ask anyone for wedding day advice they always tell you to make sure you eat something -- Daly brought us food all evening, and made sure we tried everything. After working with her I feel as though she didn't just help plan with the wedding, she also became a friend. She comes highly recommended by us and she is great to work with. She got along great with all our vendors and actually knew almost all of them prior to our wedding. I wish we had something else to plan so we could work with her again. My husband and I had barely considered hiring a planner as we planned our own wedding. With our own career backgrounds in events, we felt that IF we were to hire someone to execute our day they would have to be a very special individual (to meet our expectations and standards). Yet, as soon as we got to know Daly it was a done deal. We were hiring her! Without a doubt, it was one of the best investments as part of our wedding budget. Daly was exactly what we needed to make our day. Her ability to see our vision and execute to our expectations was right on. She had a perfect sense of our personalities and exercised patience and professionalism throughout the process. She is extremely organized and always went above and beyond to make sure our day was exactly what we wanted. Her ability to multi-task and handle all different types of personalities was a big key to the overall execution of our day. We can't thank her enough for always being a phone call away with silly little questions we had that may not have been "included" in her package. She truly has a talent to make weddings run perfectly, so the bride and groom can enjoy their day with their loved ones while not having to worry about all the tiny little details and timing. We were so relaxed the entire day knowing that Daly was taking care of things. Having Daly help with my wedding was like having my own personal fairy godmother. She kept me organized during the busy planning months and most importantly, lifted an enormous amount of stress off of my shoulders the day of the wedding. All morning long I simply focused on getting ready and arriving to the church on time because I knew Daly had everything else under control. She kept me calm in the back of the church and made sure I was holding my bouquet at just the right height. After the ceremony, Daly headed straight to our venue to make sure everything was set up the way I wanted which meant I could just enjoy taking pictures with my husband and family. Of all the investments that went into my wedding, I can honestly say that hiring Daly was one of the best decisions we made. When you think about your big day, you don't realize how many little details need to come together and I can't imagine how stressful it would have been to be worrying about them all by myself. Do yourself the favor and skip the extravagant appetizer that comes with a $5/per person up charge and use that money to hire Daly. Your wedding day flies by so quickly and after all the hard work that you put into it, having Daly there will truly allow you to enjoy your special day without worrying about what's happening behind the scenes. I was referred to Daly through a friend who worked with her for his wedding at Saltwater Farm Vineyard. He highly recommended her, however to be honest I wasn't sure I needed a wedding planner, as I was pretty much doing everything on my own and thought I could handle the day of the wedding as well. I decided to reach out to Daly, as I was starting to get nervous I would be handling all the coordination the day of instead of just being the bride. Within the first few minutes of our conversation I knew I had to have Daly there to coordinate my wedding the day of. She knows Saltwater Farm Vineyard SO well, and was incredibly helpful leading up to the wedding. She was always happy to answer questions I had about the space, or what might work or not work in terms of decorations, set up, etc. And the day of the wedding, she was a rockstar! The day we got married ended up being unexpectedly chilly, and she had the best idea to hold the cocktail hour inside upstairs at the vineyard so catering could set up downstairs (we were originally slated to do cocktail hour outside). Everything went off without a hitch, and I know I owe it to Daly! My husband and I really were able to enjoy our guests and our special day thanks to Daly. She is THE BEST! Daly Planning provided day-of planning and coordination for our wedding on May 25, 2014 at the beautiful Saltwater Farm Vineyard. After meeting Daly, my husband and I immediately knew that we wanted to work her – she is energetic, enthusiastic, and extremely knowledgeable. Not only did Daly flawlessly execute our wedding day from start to finish, she was always easy to reach and happy to answer questions and offer advice, checking in frequently during the months before our wedding. For example, Daly talked me through a minor cake crisis (these things happen) while cooking a full Mexican spread for her friends on Cinco de Mayo. On the morning of our wedding, Daly worked with all of our vendors to ensure that the day went smoothly, set up all of our décor and checked in with me frequently while I was getting ready, all while working the tasting room at Saltwater Farm. Everything was going beautifully until, less than an hour before our (outdoor) ceremony, it began to POUR. Daly calmly talked us through our options and came up with a creative solution for an indoor ceremony that did not disrupt our plans for cocktail hour or dinner. Our ceremony took place just inside the main entrance of the winery with the doors left open, allowing us to bring the outdoors in. During dinner and our reception, Daly made sure that everything ran on schedule, ensuring plenty of time for dancing. At the end of the night, while we said goodbye to our guests, Daly packed up all of our décor items and she and my bridesmaids cleaned the bridal suite and packed my overnight bag. Daly took care of every detail and we enjoyed every minute of our wedding day, knowing that we were in good hands. Working with Daly felt like planning our wedding with a friend. She is a true professional and expert multitasker who cares about her clients and is committed to working with you to plan a unique and unforgettable wedding. In short, our wedding day was perfect, thanks to Daly. We would happily recommend Daly Planning to anyone planning a wedding!